A couple of handfuls of Cannellini beans show the beautifully dried beans ready to be bagged for storage away from critters that would like to eat them as much as I would! And this is just one of the many things we are harvesting from the garden this month! But not anymore. Not since I realized that growing the food was less than half the battle. I mean, there's a lot to do on that account too, more will be revealed very soon, but getting the harvest in and making good use of it is another important part of gardening. It's hot work, but this week alone, I've harvested 10 pounds of those famous Italian Cannellini beans (a dried bean sometimes referred to as 'white kidney beans' but that refers to the physical appearance and not to their eating or cooking qualities), about as many pounds of peppers – mostly the sweet banana types that I hope to pickle soon. As well as the tons of cucumbers I am hauling in. Did you follow my advice and plant any Armenian cucumbers? If you did, you are swimming in cucumbers by now and have come to realize the reason that pickles have such prominence in our culture! There are several ways to deal with fresh produce that will allow you to eat from your garden long after the heat of August is gone. You can dry the produce. This is the easiest way. 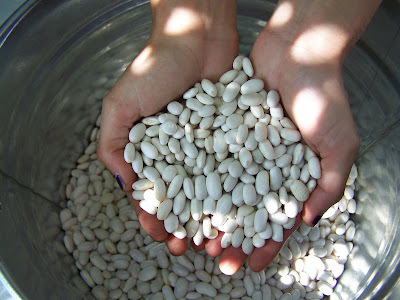 Beans, like my Cannellinis (above), are simply left on the plant until the pods are crispy and ready to drop the white bean seeds on the ground. I come along, gather them up and lay them in a dry, partly sunny location to dry for a couple of days. In Southern California that should do them nicely. Putting them away with too much moisture could result in moldy beans when you want to use them in cooking. Juicier veggies can be dried too, but they take longer and are a little more involved. If you want to dry tomatoes, or peppers, pick up a good book on drying. Look for a list of my suggested books soon. Drying has the wonderful advantage of not being dependent on the power grid to continue to be edible, unlike freezing which is totally dependent on electricity. Likewise canning definitely cannot be done without careful consideration. Pickling making jams, a subset of canning, is not quite as involved as other types of canning though it too needs to be done with some awareness. Pickling and jams are easier because the high acidity or sweetness (pickling uses vinegar, jams and jellies avoid botulism with lots of sugar) keeps the bad organisms from growing in your food without using a pressure cooker. Get a good book on canning and pickling and you will discover a whole new world. Certain kinds of fermentation have begun to make a comeback in modern times. Making alcohol has been one way of preserving grape juices, and apple jack for apples. They require no refrigeration, because most of these methods predate electricity by a couple hundred years. Again, delving into that would take more space than I can muster right here. But do give how you will keep some of your harvest on into the coming months should be a priority in this month of plentiful heat and produce to match! Check back next week for more August doings.